Psoriasin has been identified as a gene that is highly expressed in pre-invasive breast cancer, but is often downregulated with breast cancer progression. It is currently unknown whether psoriasin influences epithelial cell malignancy directly or by affecting the surrounding environment. However the protein is found in the nucleus, cytoplasm as well as extracellularly. In the present study we have sought to identify potential psoriasin-binding proteins and to describe their expression profile in breast tumors. The yeast two-hybrid method was used to identify potential binding partners for psoriasin. 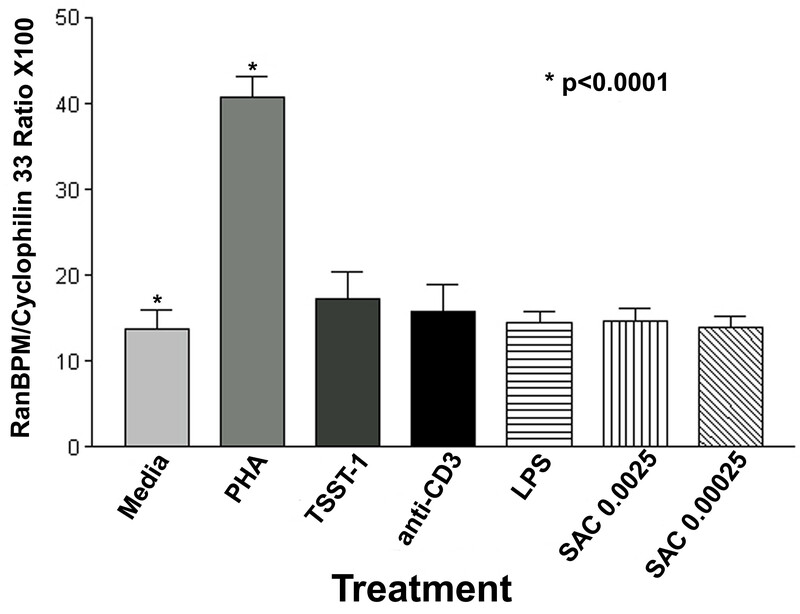 The interaction of psoriasin with RanBPM was confirmed in-vitro by co-immunoprecipitation. The expression of RanBPM and psoriasin was measured by RT-PCR in a series of breast cell lines, breast tumors and primary lymphocytes. We have identified RanBPM as an interacting protein by the yeast two-hybrid assay and confirmed this interaction in-vitro by co-immunoprecipitation. RT-PCR analysis of RanBPM mRNA expression in cell lines (n = 13) shows that RanBPM is widely expressed in different cell types and that expression is higher in tumor than in normal breast epithelial cell lines. RanBPM expression can also be induced in peripheral blood mononuclear cells by treatment with PHA. RanBPM mRNA is also frequently expressed in invasive breast carcinomas (n = 64) and a higher psoriasin/RanBPM ratio is associated with both ER negative (p < 0.0001) and PR negative status (p < 0.001), and inflammatory cell infiltrates (p < 0.0001) within the tumor. These findings support the hypothesis that psoriasin may interact with RanBPM and this may influence both epithelial and stromal cells and thus contribute to breast tumor progression. We have previously identified the psoriasin gene (S100A7) as highly expressed in pre-invasive breast cancer and subsequently found that persistent psoriasin expression in invasive breast cancer is associated with markers of poor prognosis . The S100 proteins are calcium-binding proteins that may influence several cellular activities such as growth, chemotaxis, adhesion and cytoskeletal activity [1–3]. The function of psoriasin and its influence in breast cancer is unknown. However in vitro and in vivo study of its role in psoriasis  and also in breast tumors  suggests that one possible role may be to influence the inflammatory response as a secreted chemotactic factor. We  and others  have also observed nuclear and cytoplasmic expression within squamous and breast epithelial cells which raises the possibility of an additional function within epithelial cells. We therefore sought to pursue a possible intracellular function by utilizing the yeast 2-hybrid approach to screen a normal human breast expression library for intracellular breast epithelial proteins that might interact with psoriasin and that might offer insights into its functional role in breast tumor progression. The full-length psoriasin coding sequence was cloned in frame with the Gal4 DNA Binding Domain (BD) of the Bait plasmid pGBT9 (Clontech) by PCR. pGBT9-psor was transformed into Saccharomyces cerevisiae strain KGY37 (supplied by R.D. Gietz) followed by growth on selective media. 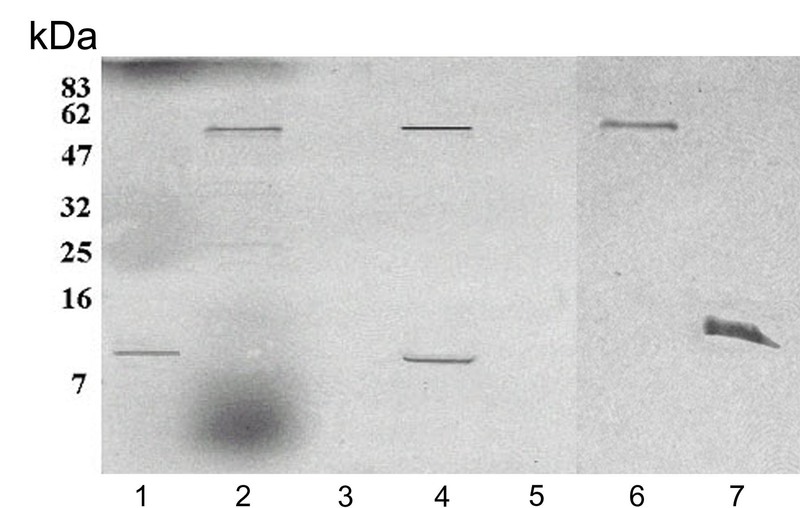 Expression of the psoriasin fusion protein was confirmed by Western Blot (data not shown). A normal human mammary gland cDNA Prey library (Clontech) was screened for proteins that potentially interact with psoriasin. We screened 1.73 × 107 clones (4X the complexity of the library) and 242 colonies were picked to assay for expression of the LacZ reporter gene. Clones showing positive LacZ expression had the library plasmid isolated to test for the specificity of their interaction with psoriasin. Full-length psoriasin coding sequence cloned into pcDNA3.1 (InVitrogen), and RanBPM (amino acids 230–730) cloned into pcDNA4 HisMax (InVitrogen) in-frame with the N-terminal His-Xpress epitope tag. 35S-Met labelled protein was generated using the Wheat Germ TNT kit for psoriasin and Rabbit Reticulocyte TNT kit for RanBPM according to manufacture's protocol (Promega). Labeled proteins were co-immunoprecipitated in buffer (50 mM Tris-HCl pH 7.5, 137 mM NaCl, 0.05 mM CaCl2, 0.05% Triton X-100) using anti-HisG antibody (InVitrogen). Samples were electrophoresed through a 15% Tris-Tricine polyacrylamide gel as previously described . The gel was then dried and autoradiography to detect labeled proteins. Peripheral blood leucocytes were obtained from five healthy subjects by venepuncture and cultured as previously described  Breast cancer cell lines were obtained from the ATCC and were cultured as previously described  in DMEM supplemented with 10% fetal bovine serum, 100 units/ml penicillin, 100 μg/ml streptomycin and L-Glutamine. MCF10A cells were the kind gift of Dr. Fred Miller (Wayne State University, Detroit MI). All cells were grown at 37°C in a humidified atmosphere of 95% air and 5% CO2. Breast tumor cases were selected from the Manitoba Breast Tumor Bank (Winnipeg, Manitoba, Canada), which operates with ethical approval from the University of Manitoba's Ethics Board and processed previously described . Tumors with estrogen and progesterone receptor levels above 3 fmol/mg total protein and 15 fmol/mg total protein, respectively, were considered ER or PR positive. The study cohort comprised 64 invasive carcinomas selected to represent a range of tumor types and on the basis of high tissue quality, presence of invasive tumor within >35% of the cross section of the frozen block and minimal (<5%) normal or in situ epithelial components. The study group included different invasive tumor types (34 ductal, 13 lobular, and 17 'special type' tumors), and a range of ER status (19 negative, 45 positive), PR status (30 negative, 34 positive) and stages (37 node negative, 27 node positive). RT-PCR was performed on extracted total RNA (200 ng) that was reverse transcribed as described previously . Real-time Quantitative PCR and analysis was performed with the Roche LightCycler. Each PCR reaction was performed in a total volume of 20 μl and consisted of 0.2 μl of each sense and anti-sense primer at 50 μM, 1.6 μl of 25 μM MgCl2, 15 μl H2O, 2 μl Master Mix (LightCycler- DNA Master SYBR Green I) and l μl cDNA template. The psoriasin primers were sense (5'-AAG AAA GAT GAG CAA CAC-3') and antisense (5'-CCA GCA AGG ACA GAA ACT-3') corresponding to the cDNA sequence. RanBPM primers were sense (5'-CGC ACA TTT TTC AGG TTT-3') and antisense (5'-CTT GCC ACA GTC TCT CCT T-3'). Cyclophilin 33 was used as a loading control for analysis of RanBPM in cell lines and PBMCs using sense (5'-GCT GCG TTC ATT CCT TTT G-3') and antisense (5'-CTC CTG GGT CTC TGC TTT G-3'). All PCR primers were designed to span at least one intron-exon boundary to prevent amplification of possible genomic DNA contamination. For PCR amplification in the LightCycler melting curve analysis was preformed at the end of the cycling program to confirm specificity of amplification. Psoriasin, cyclophilin 33 and RanBPM PCR products were each cloned into pGEM-T Easy (Promega), sequenced and then serially diluted separately to construct the standard curve used for quantification of mRNA expression. Tumors from each cohort were processed as a batch, from frozen sectioning to RNA extraction, reverse transcription in duplicate and then duplicate PCRs from each RT reaction. Controls included RT- and RNA- controls. RNA from PBMLs of five subjects were collected from 3 × 106 cells after 24-hour treatment (10 μg/ml PHA, 0.1 ng/ml TSST-1, 30 ng/ml anti-CD3, 10 ng/ml LPS and SAC stimulation at 0.0025% and 0.00025%) as well as unstimulated cells grown for 24 hours in media alone. All RNA isolations were performed using Tri-reagent according to the manufacture's directions (Sigma). For statistical analysis, psoriasin and RanBPM mRNA levels and the psoriasin/RanBPM ratio were assessed either as a continuous variable or transformed into low or high expression categories using the 75th percentile as a cutpoint for all variables. This cutpoint was selected as it corresponded to the minimum mRNA level at which psoriasin protein could be detected by Western blot analysis of frozen sections from a subset of the tumors (Data not shown). Correlations were tested using Spearman's test and associations with categorical variables were tested by Chi-squared test. For induction of RanBPM in PBMC, one-way ANOVA (nonparametric) analysis was performed on the means of duplicate Reverse Transcription samples for selected treatments. The yeast Bait vector pGBT9-psoriasin was used to screen a normal human mammary gland cDNA expression library (Clontech) to identify potential proteins with which psoriasin forms a physical interaction. Clones that grew on selection media were isolated and examined for the strength and specificity of their interaction with psoriasin. Four clones were identified that specifically interacted with psoriasin in the yeast system. We pursued the interaction of RanBPM (clone 6–3) with psoriasin as it presented the strongest interaction, as determined by the intensity of activation of the reporter gene LacZ (data not shown). Psoriasin was demonstrated to specifically interact with RanBPM in the yeast system (Figure 1). Confirmation of specificity of interactions observed in yeast 2-hybrid assay. 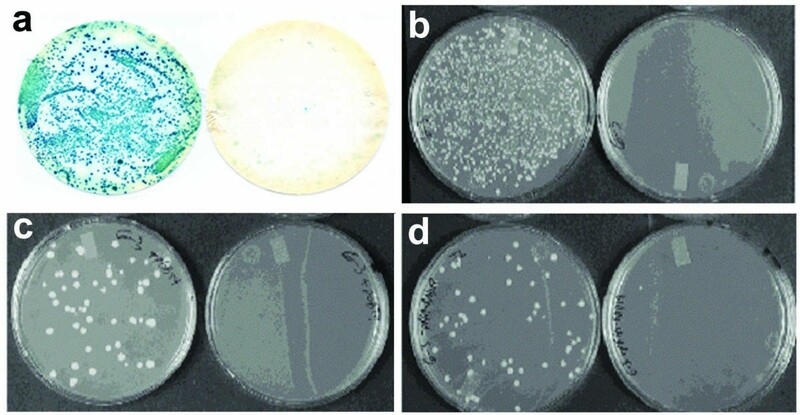 Panels show yeast transformed with a) psoriasin and RanBPM expression plasmids (left) and RanBPM alone (right), and yeast transformed with b) Psoriasin alone, c) psoriasin and empty prey vector, and d) psoriasin with a control gene not isolated in the primary screen. In panels b-d, plates on left are Histidine + (control) and plates on the right are Histidine – (test). Panel a) shows activation of LacZ reporter gene only occurs in yeast transformed with both expression plasmids (left) and no activation in yeast transformed with RanBPM alone (right). Panel b) shows that psoriasin alone cannot activate the Histidine reporter gene as demonstrated by absence of growth on Histidine – plate. Panels c) and d) show that there is a specific interaction necessary for activation of the reporter gene. Both psoriasin and RanBPM were cloned by PCR into their respective expression vectors downstream of a T7 promoter and 35S-Met labeled proteins were generated. The radiolabelled proteins were immunoprecipitated by addition of anti-HisG antibody, which specifically detects the His-tagged RanBPM protein. As shown (Figure 2), the protein-protein interaction observed in yeast was confirmed by these co-immunoprecipitation studies. In vitro interaction of psoriasin and RanBPM as determined by co-immunoprecipitation. 35S-Met labelled proteins were generated. Psoriasin (lane 1) and RanBPM (lane 2) were electrophoresed through a denaturing polyacrylamide gel and detected by autoradiography. Psoriasin binds to and co-immunoprecipitates with RanBPM (lane 4). RanBPM and psoriasin do not bind to protein G-beads on their own, (lane 3 and 5 respectively). RanBPM does not interact with mouse submaxillary gland protein when either RanBPM (lane 6) or mouse submaxillary gland protein (lane 7) is precipitated. 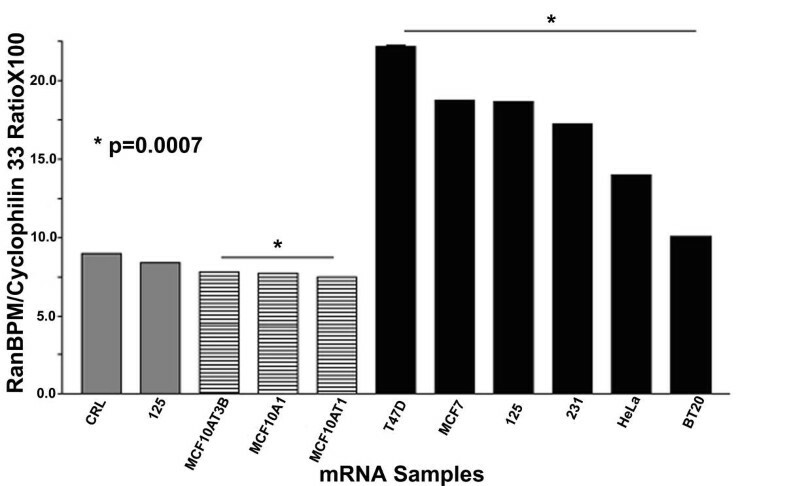 RanBPM mRNA expression was assessed by RT-PCR in established fibroblast and epithelial cell lines and in freshly obtained peripheral blood mononuclear cells (Figure 3). RanBPM was detected in all cells and the relative levels differed between cell types. Amongst the established cell lines there was no significant difference between fibroblasts, normal epithelial cells and Ras-transformed derivatives of the same normal epithelial cell. RanBPM expression was consistently higher in tumor cell lines compared to normal cells (p = 0.0007), with up to a 3-fold difference in levels. Within the set of 5 breast tumor cell lines examined, no relationship with ER status or epithelial differentiation was evident. Psoriasin expression was undetectable or very low in all cell lines (data not shown). RanBPM mRNA expression in selected cell lines. RanBPM mRNA expression in fibroblasts (CRL and 125), normal mammary epithelia (MCF10ATB, MCF10A1, MCF10AT1), and epithelial carcinoma cell lines from breast (T47D5, MCF-7, 126, MDA-MB-231, BT20) and cervix (HeLa). RanBPM is expressed at higher levels in cells derived from tumors compared to those derived from normal epithelia and stroma. Columns and bars represent means and standard deviations from duplicate experiments. Mann Whitney test was used to compare levels between normal epithelial cells and fibroblasts (*) or neoplastic epithelial cells (**). RanBPM expression was also examined in primary cultures of peripheral blood mononuclear cells. In experiments with samples from 5 healthy subjects, RanBPM mRNA was strongly induced in cells following 24-hour stimulation with the polyclonal activator PHA (p < 0.001). PHA elicits dominantly Th2 associated cytokine response . In contrast, cells stimulated by polyclonal activators that elicit Th1 dominated immunity (anti-CD3, TSST-1) or cytokine production by antigen presenting cells that is Th1 inducing (LPS, SAC), an increase in RanBPM expression was weak to undetectable (Figure 4). No significant differences were apparent in RanBPM expression between male (n = 3) and female (n = 2) subjects in this sample. RanBPM mRNA expression in peripheral blood mononuclear cells (PBMCs). RanBPM mRNA expression is strongly induced by stimulation of cells with PHA, weakly induced by TSST-1, but not anti-CD3, LPS or SAC. Columns and bars represent means and standard deviations from duplicate experiments performed on samples from 5 donors. The relationship between RanBPM, psoriasin, the psoriasin/RanBPM ratio and indicators of differentiation and prognosis was examined in a series of 64 invasive breast tumors by quantitative RT-PCR (Table 1). Higher levels of expression of either RanBPM or psoriasin were present in only 16/64 and 16/64 tumors respectively, however high levels of expression of both genes was observed to coincide in 4/64 cases. This small subset of cases showed no significant distinguishing clinical features. Higher RanBPM mRNA levels were seen in association with ER positive status and low inflammation. However there was no significant difference in RanBPM mRNA expression with any parameter including indicators of differentiation (ER, PR, tumor type or grade) or stage (tumor size and nodal status) or with cellular composition of the tumor section (inflammation and proportion of epithelial tumor cells and stroma). At the same time higher levels of psoriasin expression were significantly associated with ER negative and PR negative status and inflammation (Table 1). The psoriasin/RanBPM ratio showed even stronger and highly significant associations with the same three parameters, and it was also higher in medullary carcinomas compared to other special type tumors (mucinous and tubular), lobular, and ductal carcinomas (p = 0.0313). To pursue the role of psoriasin (S100A7) expression in breast cancer we sought interacting proteins in breast epithelial cells using the yeast 2-hybrid assay. We have identified RanBPM as a potential interacting protein and confirmed this interaction by in vitro assay. Study of cell lines and breast tumors shows that RanBPM mRNA is widely expressed and that while RanBPM expression shows no specific relationship with markers of differentiation or prognosis, high levels of expression of both genes is present in some tumors, and a strong association exists between the psoriasin/RanBPM ratio and both ER/PR status and inflammatory cell infiltrates within the tumor. The biological role of psoriasin in breast tumors is not known, however it may be related to aspects of tumor progression. This role might be mediated either through an indirect influence on the host immune response or through a more direct influence on the epithelial tumor cell. The first hypothesis is supported by correlations between psoriasin and the intensity of the host inflammatory cell response within invasive breast tumors  and in vitro effects as a secreted chemotactic factor for T-cells . The second hypothesis is supported by evidence that psoriasin may not only be secreted [9, 10]. but also can be localized in both nuclear and cytoplasmic epithelial cell compartments in normal skin and breast tumors . Other secreted S100 proteins have also been localized to cytoplasm and nucleus  and altered subcellular localization in disease has also been observed with a keratinocyte S100 related protein, profilaggrin [12, 13]. RanBPM was originally described as a Ran binding protein that is highly conserved between human, mouse and hamster, and detectable in both skin fibroblast and HeLa cell lines . However, more recently it has been found that the original study had centered on a N-terminally truncated cDNA and that the full size RanBPM cDNA encodes a larger 90 kDa protein that localizes to both the nucleus and also to the peri-nuclear and peri-centrosomal cytoplasmic region in HeLa cells . While RanBPM was identified through its ability to interact with the Ran nuclear-cytoplasmic transport protein in the yeast system, when overexpressed the c-terminal portion of RanBPM was capable of causing reorganization of the microtubule network and ectopic nucleation of microtubules in vivo, and this effect could also be inhibited by GTP-Ran . This is of interest as although Ran is known to play a key role in nuclear transport [16, 17], it has also been associated with a variety of additional functions, including cell proliferation and viability in breast cells  that may be mediated by interactions with a number of Ran binding proteins. While the full length RanBPM has now been identified, the exact role for this protein in microtubule function remains to be explored. Our findings here confirm that RanBPM is expressed in multiple cell types and show that it may be increased in breast tumor cell lines. In breast tumors higher levels of expression of RanBPM and psoriasin overlapped in some cases. While this small subset of cases showed no significant distinguishing clinical features and there was no association with known prognostic factors, the expression of RanBPM was inversely related to psoriasin. There was also a tendency to higher levels of RanBPM in association with ER positivity and low levels of inflammation, leading to highly significant differences in the psoriasin/RanBPM ratio in tumors that differed by ER status and extent of inflammation. This latter association is also supported by the higher psoriasin/RanBPM ratio found in medullary carcinomas compared to other invasive tumors, where higher levels of inflammation are inherent in the diagnosis of this special tumor type. Our data also suggests that RanBPM is rapidly expressed by primary PBMC, in particular upon stimulation leading to type-2 immunity. This raises the possibility that RanBPM could be a target for mediating the actions of secreted psoriasin, perhaps affecting T cell trafficking to activated or inflamed sites. Psoriasin has also been found to interact with two other proteins. It is a substrate for transglutaminases TG1 and TG2 , and a binding partner for epidermal fatty acid binding protein (E-FABP) in epidermis . Transglutaminases are expressed in both epithelium and inflammatory cells and their cross linking capacity is associated with a range of functions including apoptosis and terminal differentiation in keratinocytes, cross linking of extracellular matrix proteins, and interaction with integrins to mediate adhesion and motility of monocytic cells . The FABP proteins have also been implicated in terminal differentiation in both epidermis and breast epithelium where overexpression of H-FABP and B-FABP can both cause growth inhibition and reduction of tumorigencity in mammary carcinoma cells. In the CNS, B-FABP has also been implicated in the control of the glial fibre system and neuronal migration. RanBPM is a third interacting protein, that is expressed in several cell types, is induced in PHA stimulated peripheral blood leucocytes, and when overexpressed as a truncated protein can affect microtubule function. The interaction with psoriasin may just reflect a common mode of intracellular transport. However, one common functional association to these three interacting proteins is an involvement in cytoskeletal functions, adhesion, and migration. Alterations of adhesion and polarity are associated with the progression of breast cancer and are inherent in the process of invasion. While psoriasin expression in keratinocytes  is associated with changes in adhesion, it remains to be determined if manipulation of psoriasin in squamous and breast epithelial cells can directly influence cell adhesion. In conclusion, we have shown that psoriasin interacts with an intracellular protein, RanBPM in-vitro. Further study to confirm the interaction in-vivo and explore the biological role of RanBPM in breast and inflammatory cells may help to elucidate the role of psoriasin in breast cancer. E.D.E. is the recipient of a U.S. Army Medical Research and Materiel Command Predoctoral Traineeship Award. Grant Number: DAMD17-00-1-0320. We thank Dr. Yvonne Myal for the mSMGP construct and antibody. EE performed the Yeast 2-hybrid screen, co-immunopreciputation studies, RT-PCR analysis. RDG assisted in the Yeast 2-hybrid screen. JDC cultured and stimulated the PBMC cultures. KTH designed the PBMC experiments. LCM participated in the design of the study. PHW conceived of the study, and participated in its design and coordination.